Korea recently took an initial step to join the Trans-Pacific Partnership (TPP) trade pact aimed at lowering trade barriers between countries in the Asia-Pacific region. But the Seoul government’s approach toward free-trade deals has brought about mixed responses from experts, businesses and politicians in the past week. Proponents say that the export-oriented country will secure a big market spanning over the Asia-Pacific region, while opponents say the deal will wreak havoc throughout the automobile, agriculture and livestock industries. The government said in a statement that it will initially express its interest in becoming part of the TPP trade group at the World Trade Organization (WTO) minister-level talks in Bali, Indonesia in December. 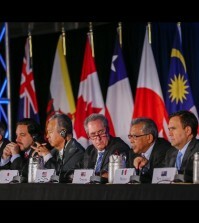 One-on-one meetings with the TPP’s 12 negotiating countries will follow the expression of interest, said the statement. “But the country has not made any final decision to attend the TPP,” said the minister. Depending on the outcome of preliminary meetings and local studies, Seoul will decide on whether to become an official member of the TPP group, said the statement. The TPP deal, which is being negotiated by the U.S. and 11 other countries ㅡ Japan, Australia, New Zealand, Canada, Singapore, Brunei, Vietnam, Chile, Malaysia, Mexico and Peru ㅡ would account for nearly 40 percent of the global economy. The 12 countries aim to complete talks this year to generate a mega-sized free trade group. But there may be delays in wrapping up the three-year-long talks given that there has been no significant progress due to conflicts of interest. In their separate talks, The U.S. and Japan, two economic powerhouses, have failed to narrow their differences over the abolition of tariffs for rice, barley, beef and dairy products, according to the Ministry of Trade, Industry and Energy. That’s why the government has not given serious consideration on the world’s largest multilateral trade bloc so far, said the ministry. Chances are that Korea may be left out of the U.S.-led trade pact due to its much-delayed expression of interest. Only unanimous approval from the 12 would-be members will allow a new member to join the multilateral economic round. The U.S. welcomed Korea’s interest in the TPP. U.S. Trade Representative Michael Froman recently said that Korea will probably be able to join the 12 current member countries if they strike a deal between them, according to the ministry. Thus far, Korea has mainly focused on bilateral trade deals including those with the European Union and the U.S. that became effective in 2011 and 2012, respectively. 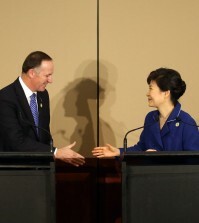 Korea already has bilateral free-trade pacts with five of the TPP’s negotiating parties, and it is in talks with five others, which would limit the benefits of entering the TPP. 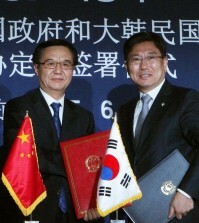 On Thursday, Korea and Australia tentatively reached a free-trade agreement. In the manufacturing sector, carmakers are already under pressure from Korea’s possible joining the TPP trade group as the pact allows Japan-made vehicles to enter Korea without tariffs. Korea-made vehicles are already tariff-free products in Japan but local demand for Korean vehicles in Japan is low. “If Korea goes to the TPP, separate talks with each of the 12 member states will be more beneficial for the country’s interests. Korea should make clear what they want,” said an official from Hyundai Motor Group asking not to be named. “If not, it may be only a losing game,” he said.